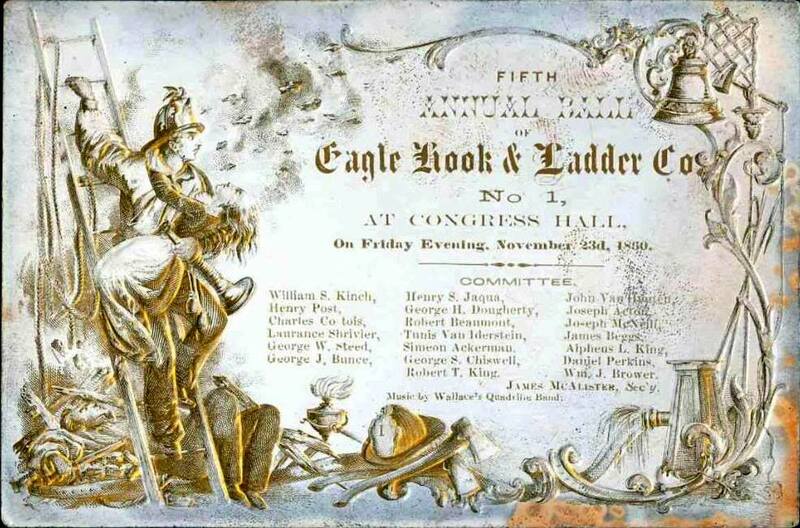 On March 22, 1839: Eagle Hook and Ladder company 1 was organized and placed in service at a house on John Street (later renamed Ellison Street), between Cross and Prospect Streets next to Washington Engine No. 3's house. 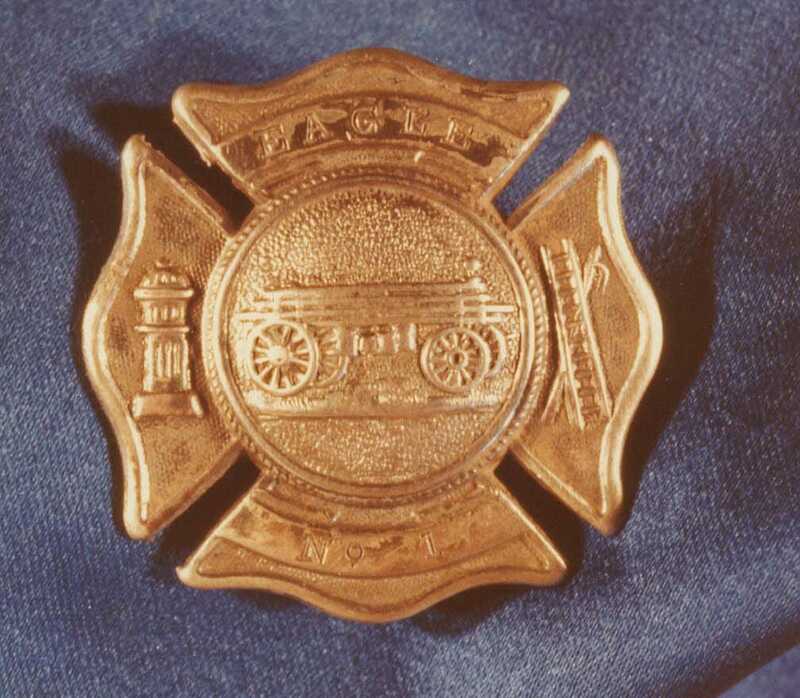 Before there ever was an official Hook and Ladder Company, the Paterson Fire Association had ordered hooks (spars) and ladders which were stored at Engine Company No. 1. 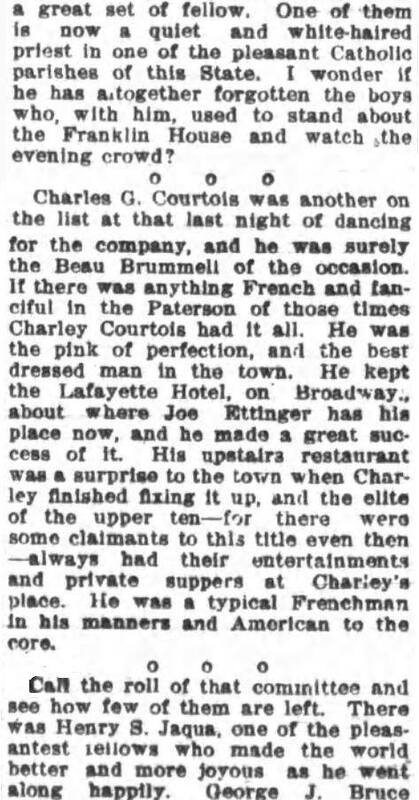 On September 7, 1917 the Chronicle published details from the Paterson Fire Association minutes which detail the evolution of the company. 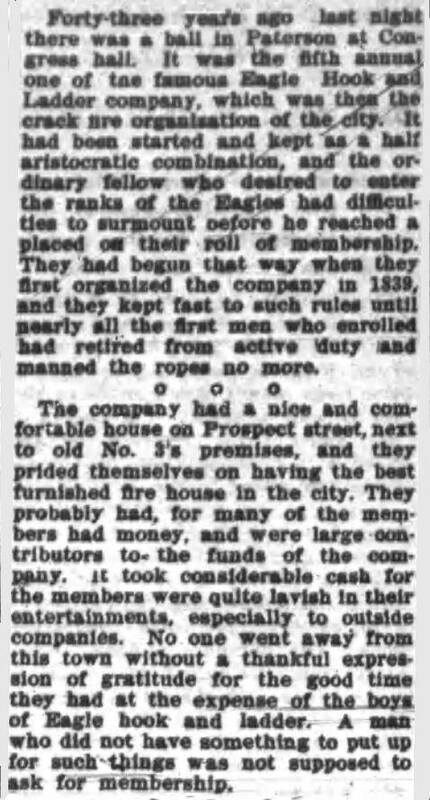 1856: Eagle Hook and Ladder Company along wth Washington Engine Company 3 moved from John (Ellison Street FH) into new quarters on 147 Prospect Street (between Ellison and Market Streets). 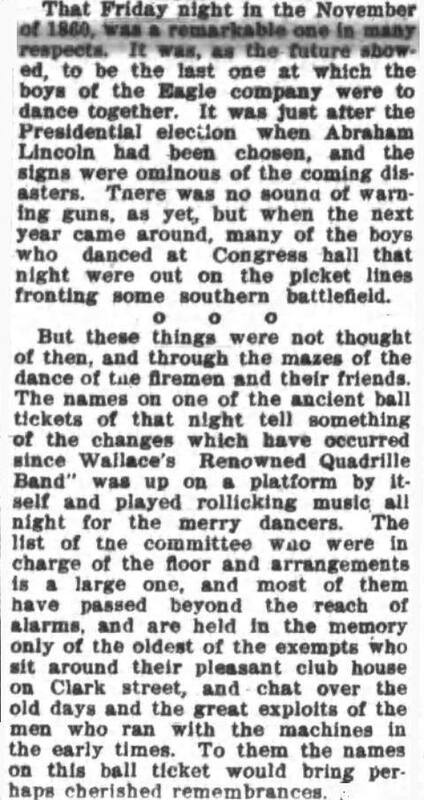 November 1860: 5th Annual Ball of Eagle No. 1 at Congress Hall. The following is a review of the event published on its 50th anniversary in the Paterson Evening News. Civil War: 16-18 company members joined the Infantry Company 2nd NJ. They were escorted to Trenton by the entire company. 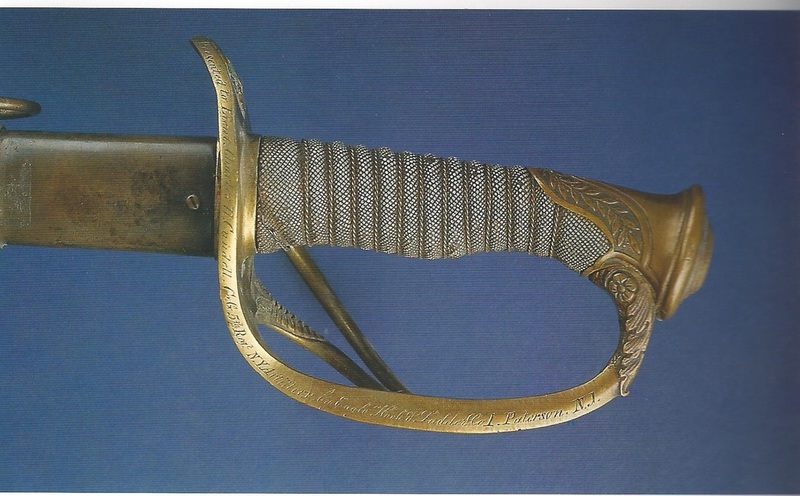 Captain Buckley and Lieutenants Cooke and Clundell were presented with swords, sash, belts, etc. February 20, 1872: Paterson Daily Press article re new apparatus to be delivered on February 21. The older truck will be sent away for a rebuild and then return to Paterson (to be used by Truck Company 2). 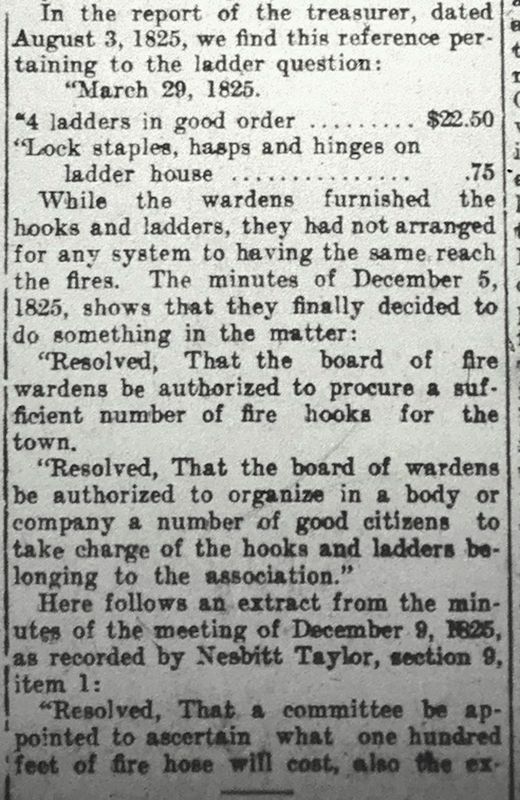 February 21, 1872: Arrival of new "light" hook and Ladder Truck built in Brooklyn (Paterson Guardian). Truck went into service on February 22. 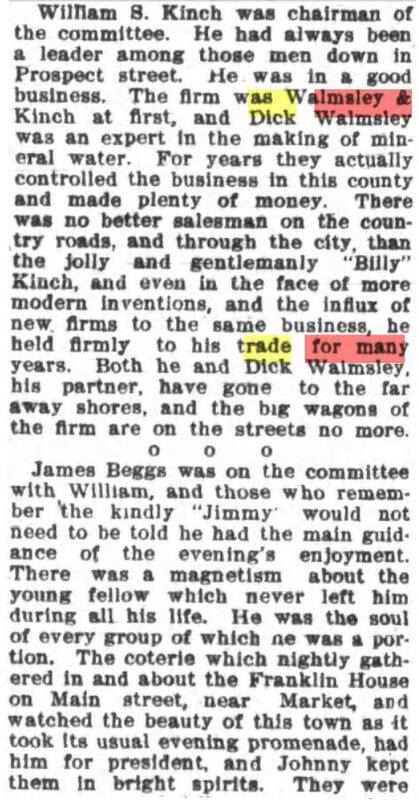 February 22, 1872: Thorough description of new truck in the Paterson Daily Press: 800-1000 pounds lighter than previous truck (thus easier to pull). Frame and wheels are red with gilding. There are 7 black ladders including a short roof ladder (imprinted with "Eagle"). There are 4 axes and two picks and the lanterns are engraved with "Eagle." 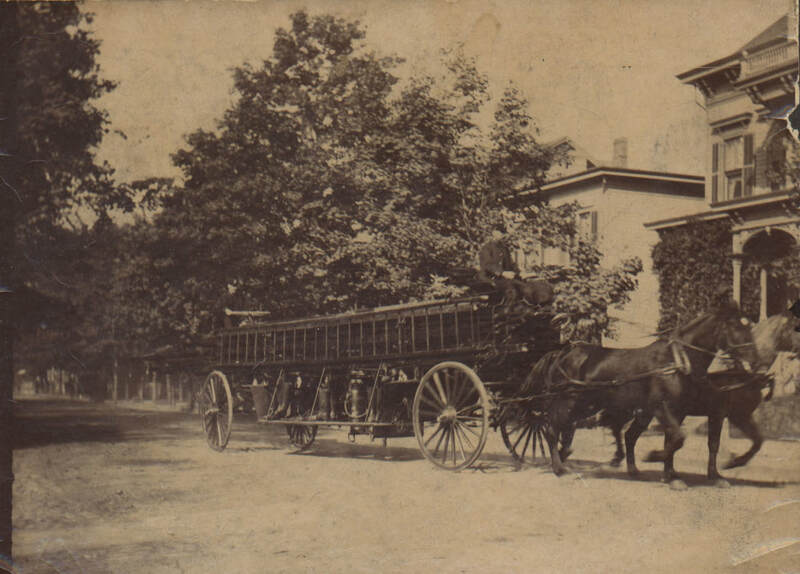 1873: New two story brick firehouse at 72 Jackson street (between Slater and Green Streets). 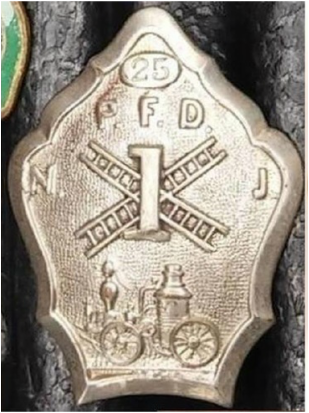 Both the quarters and the 1872 hand-pulled ladder truck is below. Note the rope the members would grab to haul the ladder truck. 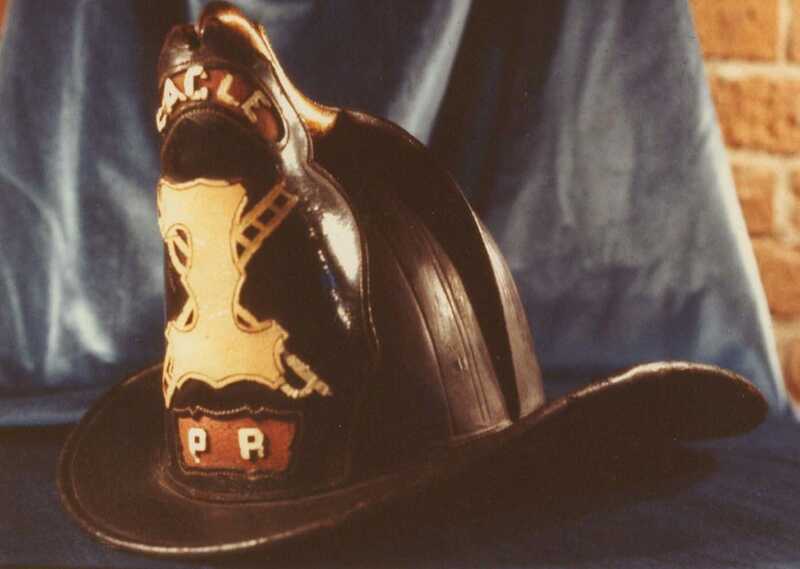 Leather fire buckets hang from belly, lanterns and trumpet hang from the front yolk, high eagle helmet sits on front yolk and the Engine Lamp atop the ladders. A close looks shows a yolk extending from the rear of apparatus which was operated by the tillerman [original definition of a tiller was a horizontal bar fitted to the head of a boat's rudder post and used as a lever for steering]. The ropes on the side are for men to stand on when taking ladders off the truck. 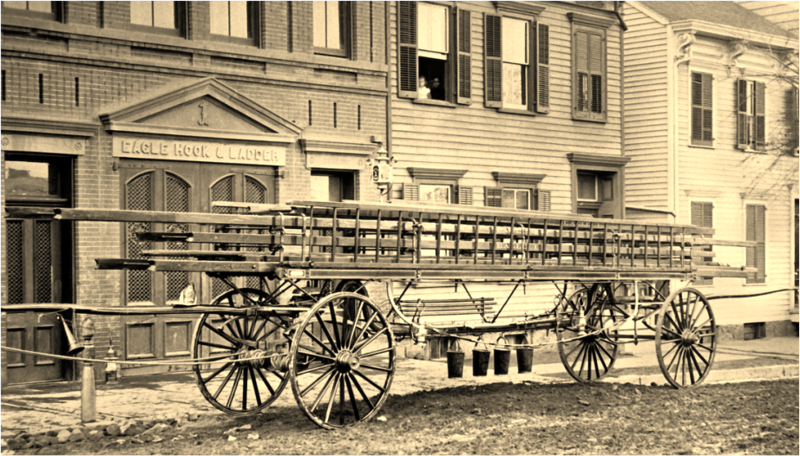 July 3, 1880: The firehouse, apparatus and furniture were burned up, but immediately re-built. The details are in the following news clips. 2 James Kearney.......... Plumber .... ......26 Jackson street. 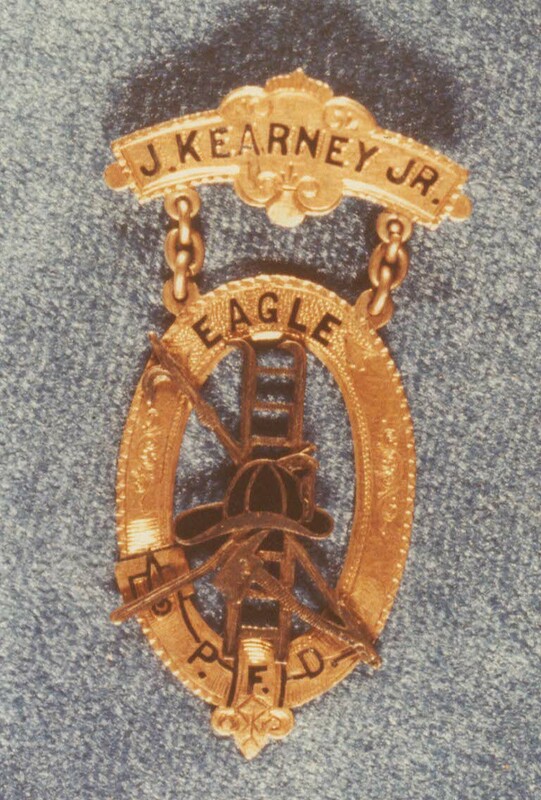 3 Joseph Kearney. .....Boiler Maker. . . . . . .26 Jackson street. 4 James Gilbert. ...... .. .Liquor Dealer.. . . . .50 West street. 5 Thomas Elvin........... Machinist. .........26 Harris street. 6 Dennis Murphy. ......Machinist ......... .440 Main street. 8 John Dowdell. .......... .Liquor Dealer.. .. . .224 Slater street. 11 Patrick Fitzpatrick...... Moulder. .......... 114 Spring street. 12 James Murphy.......... Engineer. ..... .... 153 Mechanic street. 13 Charles Berdan. ........ .Machinist. ........ .218 Mill street. 14 Thomas Moore. ........ Machinist .... ......200 Mill street. 15 Charles Golmer. ........ Harness Maker. ... 188 Marshall street. 16 James O'Neill........... Mill Hand.. .......209 Slater street. 17 Thomas McDonaughl. ....Mill Hand ..........58 Oliver street. 19 John C. Mead. .......... Machinist. ......... 139 Vine street. 20 John Vesey. ............ Plumber. . .. . ... . .463 Main street. 21 Joseph Lenton.. ....... .Silk Weaver.. . . . . .. 30 Jackson street. 22 Patrick McCue......... Moulder ........... Main street. 23 Charles Webster... .Boiler Maker. ... .. .30 Jackson street. 24 John Jones............. Mill Hand. .........102 Marshall street. 27 William Lendrim........ Machinist. .. .. ..... 29 Ryerson avenue. 28 Michael Brown .. ...... Liquor Dealer.. .... 120 Mill street. 29 William J. Stewart . .. .. Shoemaker. . ....... 136 Vine street. 30 James Bolen............ Machinist. . ...... 124 Jersey street. 32 George Eakins.. ....... .Carpenter. . . . . . .. .Cor. Mill & Grand sts. 33 Michael Cark. ........ .Boiler Maker. . . . . . .24 Jackson street. 34 Lawrence Dougherty . . .. Boiler Maker...... .505 Main street. 35 Jeremiah Condron. ...... Machinist. .........11 Broom street. 37 Robert Flanigan.... ... .Mason............ .186 Jackson street. 40 Dennis Murnaugh. . .. ..Mason. ......... .146 Marshall street. 41 Joseph Hutton. ......... Mill Hand. .. .. .522 Main street. 42 James Murray.... ..... .Boiler Maker. . .. ..522 Main street. 43 James George. ......... .Merchant . .. ... Cor Slater & Spring sts. 44 William Harbery. ..... .Silk Weaver ... Cor. Slater & Spring sts. 45 William Keys.......... .Policeman.... .. Marshall street. 47 John McCann........... Silk Weaver.. ...... Magee's Alley. 49 Frank Leow...... Liquor Dealer .... Cor. Main & Green sts. 50 Jacob Brestell. .......... Mason ..... .. ... Marshall street. 50 William J. Sweeney.. . . .Plumber. ......... .134 Jackson street. 57 Jeremiah M. Rogers... . ..Carpenter.. ........11 Sherman avenue. 58 Charles York. .......... .Silk Weaver.. . .. . . .503 Main street. 59 Michael Durkin.... .. ..Boiler Maker. ... . .People's Park.